With this option, your company will receive a 234×60 ad space visible at the top right of every pageview on the site (under the “Sponsored By” tab). This position is available first-come first served at an introductory rate of just $195/month. Several 125×125 ad spaces are available in the left sidebar, visible on every pageview on the site. Available first-come first served at an introductory rate of just $75/month. 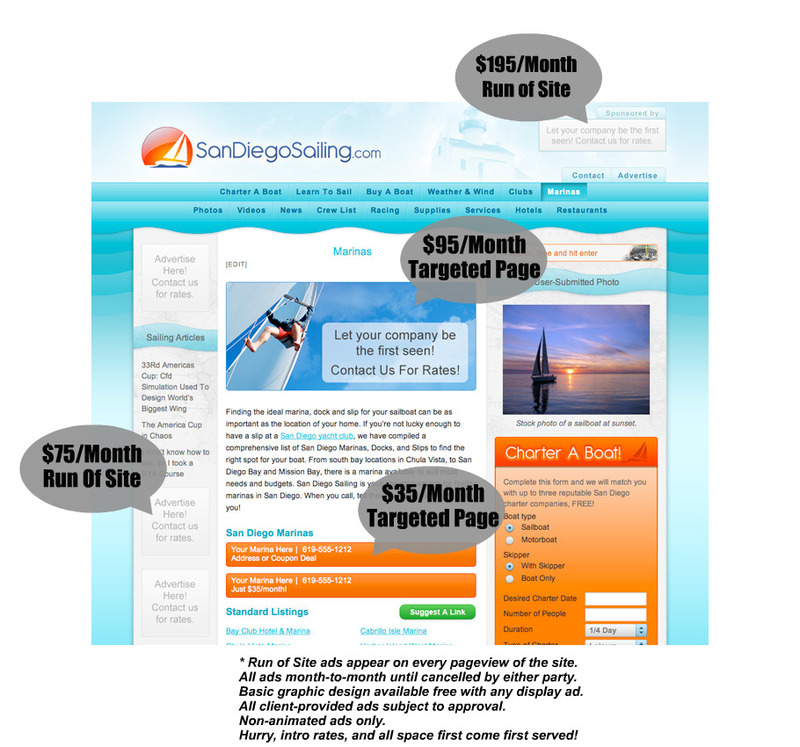 These large and highly visible 460×200 ads are available only to businesses related to the specific page the ad will run on. We can help with the graphic design, often at no charge! Available first-come first serve at an introductory rate of just $95/month. These bright orange listings come before the standard listings on all our content pages. They enable you to include your phone number, and either address or coupon deal (in addition to a link to your website). We are currently limiting each page to a maximum of three enhanced listings, available first come first served. Just $35/month! 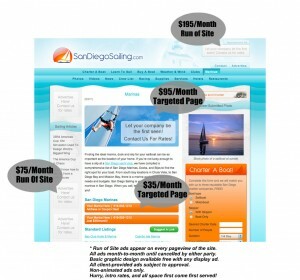 San Diego Sailing offers comprehensive lead capture forms for San Diego Sailing Charters, Sailing Instruction and Yacht Sales. What makes our lead generation services unique is not only do we carefully qualify leads with detailed questions, but our leads are strictly “pay-per-sale.” This means there’s zero risk in partnering with us for your leads, you only pay us for successful sales that come from our site. Contact us for details. All display ads are for non-animated graphics. If you need help generating an ad, we’ll be happy to help with basic graphic design at minimal or no cost to you. All ads are flexibly design as month-month, which means you can cancel them at any time. Payment available by automated monthly credit card billing (Visa, MC, Amex & Discover). Payment by check is only available with a six month commitment and payment in advance.